In my previous house, my Logitech Harmonies worked pretty well. All the AV gear was visible (much to my wife’s chagrin) and no devices were shared between TV’s. Moving house and rewiring the new abode gave me the opportunity to centrally locate the AV gear (eventually). Further, until we remodel the basement and build a dedicated theater, the living room had to double as the home theater and I didn’t want all the gear visible again. So, I got myself a new 38U rack and located everything except the TV and speakers in the basement. I continued to use the Logitechs with Microsmith’s HotLink XL’s (outstanding product and support) for some time, as I had a lot of remodeling that kept me busy, but eventually, I got tired of the limitations of the Logitech and decided to look for something new. Preferably whole-house capable. Be able to control everything with every remote. Preferably single programming for multiple remotes. Not more tedious, repetitive setup. Preferably better programming control than Logitech Harmonies. Must be able to enter hex/Proto codes for advanced commands. Learn should be an absolute last resort. IR commands must be capable of being sent to specific emitters rather than repeating everything on all emitters. Preferably, better integration with my home automation than just IR matching. My quest has ended (for now) with two URC MX-780’s and an MSC-400. Before looking at the solution I purchased, it’s worth looking at the driving factors. For the price, the Logitech Harmony is a good remote and is dead easy to setup. Basic models start at about $50. I had a couple of 550’s, which cost about $170 each. Unfortunately, one of the 550’s got stepped on and broken about a year ago. As the 550 was discontinued, I replaced it with a Harmony One. It only has three activities per screen instead of the 550’s four. The transport controls (play, pause, skip, etc.) and navigation controls got switched around, which made it a real pain switching from the 550 (in the bedroom) to the One (in the living room) on a regular basis. I think Logitech have made a bigger ergonomic mistake with the newest model: the Touch. Placing the navigation and transport controls above and below the touch screen makes it a nightmare to use, as you constantly have to change grip to operate it. I tried it for a few days and didn’t like it at all. While it’s cool to be able to browse channels on the display, the layout and touch screen were not at all to my liking. Long activity start and stop times (throughout which the user has to keep the remote pointing at the device). Rather than gloss over these, I’ll explain each in some detail. Under most circumstances this is not a problem, but it falls down in two fairly common scenarios. Sleep is one of them: we’ll address that shortly, but the other is that it precludes the use of more than one remote controlling the same devices. This is common when the AV gear is in a rack and switched to multiple monitors. For those who are unaware, the way the Harmony works is that it tracks the state of the devices its controling internally. For arguments sake (as most people understand basics like variables), let’s assume there is a variable called TVOn and one called TVHDMI1. When I run my "Watch Blu-ray" activity (with my Blu-ray connected to HDMI1), it looks at the TVOn variable, sees it’s false and turns on the TV, it them switches the TV to HDMI1, powers on the Blu-ray, etc. The problem is that if I turn off the TV with anything except that Harmony remote, it has no idea it’s off. So when I select "Watch Apple TV", it thinks the TV is on and just issues a command to switch to HDMI2. Fortunately, the help button is very good at resolving these issues, and boy does it get a lot of use. If you have multiple identical devices or want the same custom buttons in an activity, it becomes a real chore to have to repeatedly do the same setup. I’ll give you a few examples from my own setup. TV Aspect ratio. I watch a lot of content with different aspect ratios and use a lot of different sources. While my Pioneer Kuro handles most of them well, there’s always the odd situation. To resolve it, I could go to devices, select the TV and find the relevant setting for the aspect ratio, but I don’t want to: I just want an “Aspect” button in every activity that uses the TV. It also means I have to remember to switch back to my current activity. If I forget, I end up calling up the TV menu instead of the guide, or something equally annoying. To add my “aspect ratio”, “menu” and “exit” commands for the TV to those activities that use the TV (six, in my case), I have to add these three custom buttons to all six. Lighting Control. I have an IR receiver on my home automation system and I can trigger events based on IR matching, so when I stop or pause a movie, the home theater lights raise to 70%, when I resume, they drop to 10%. I also have about six commonly used lighting scenes that I control from the Harmony. This means six custom buttons in all eight activities. A total of 48. AVR functions. AVR’s have many surround, EQ and DSP modes these days, and I change between three or four common settings quite a lot. For example, I like to use Dolby Volume late at night; I use the Audessey Restorer on some content; and I frequently change from PLIIx Music and PLIIx Movie on my Apple TV, as I use it for both music and video content. All of this can be accomplished, but again, means adding half a dozen buttons to every activity that uses the AVR: seven in my case. That’s 42 buttons. This is one of my real pet peeves. Most nights, I watch (or at least begin to watch) an episode of something on Netflix, Apple TV or DVR. 80% of the time, I’m fast asleep before it’s over. So, like most people, I use a sleep timer. I have custom buttons on the main activities (and, yes, I have add them again to every activity) for sleep 30 and sleep 60. This sends a sleep command either three or four times to cycle through the sleep settings. If I happen to block the IR transmitter part way thorough he process, I have to press one of the sleep buttons again. The Sleep function on my TV cycles through the following: current setting, 10m, 30m, 60m, 120m, 240m, Off. So if it accidentally gets set to 30 instead of 60. I then press Sleep 30 and have to block the transmitter after two transmissions to stop it going to 120. I could of course use a single sleep and press it four times to get to 60, but where’s the fun in that. Regardless of how I finally arrive at the correct sleep timer setting, the problem is that the TV is turning itself off, not the Harmony, so the TV switches off, the Harmony is still in the "Watch Apple TV" activity, and thinks the TV on. The next morning, when I select "Watch TV", it fails to come on, as the Harmony thinks it’s already on. Pressing the Help button solves it pretty quickly. Now, I understand why Logitech may be reluctant to support this on an IR remote. If the sleep timer were to expire on the remote and then send an off command, the IR would need to be left pointing at the TV. When you’re falling asleep watching TV, that’s rarely the case: the remote is often covered by bed linens. So an RF remote is really required for a remote-timer, based solution. This is a real killer for a lot of situations, especially professional installs. Many AV devices have additional commands beyond those on the factory remote and these tend to be used a lot by custom installers (or anyone who wants bullet proof AV control). My Pioneer Kuro’s remote has a single power button, which is an infernal toggle command. Fortunately, the Harmony does recognize that it has discrete on/off commands and handles it OK. The same cannot be said of my Panasonic Blu-ray player. I discovered that it has discrete commands for on/off, but these are not in the Logitech database and not on the remote. As the factory remote cannot generate these, the Harmony cannot learn them (usually a last resort anyway). Many PC programmable remotes allow hex or pronto codes to be entered, but this isn’t possible with Logitech. Some people say they have managed to get Logitech to add codes to their database. I’ve tried a few items with no success. Surround modes are another case where this is common. My AVR lets me send a discrete code for Dolby PLIIx Music. With the factory remote, or the Harmony, I have to cycle through about 12 modes, each one interrupting the sound, to find it. For many this option cycling is fine, but for the AV enthusiast, being able to go directly to the desired mode key. Once the power off command is sent on the Harmony, it’s off. There’s no way for the user to be able to pick it up and control the lights (for example). So for me to control my lights when I’m not in an activity, I have to either start an activity, or go to devices, select a dummy device that I created and then press the soft button for the particular lighting scene. The remote’s buttons don’t magically disappear when the power off command is issued, so there’s no good reason they should be non-functional. This is probably the biggest reasons for the excessive wear and tear on the help button. To start an activity like “Watch Blu-ray” requires keeping the remote pointed at the TV for over ten seconds. This is because the TV needs to power on and wait for a warm-up period before it will accept any commands to switch inputs (typically 5-10 secs), the AVR needs to power on and wait for a while to switch inputs there too, and finally the Blu-ray needs to power on. Many remotes that do not have a central controller will have the same issue, but it’s easy to improve it. The problem with the Harmony software is that the only option is to select how long the device needs to wait before receiving commands, so if I selected five seconds for my AVR and TV, I would end up with a ten second delay, in reality, the two could be powered on near-simultaneously and a single five second delay incurred. At first glance it seems this could be done by setting a power-on delay of zero, powering on both devices, waiting five seconds and then carrying on. The problem is that without a means to test for “is the device on?” that five second delay would be incurred when switching between activities too. What I cannot fathom is why it takes so long to turn off the TV in my bedroom. Many nights I will be watching an episode of something on my Apple TV. This is configured to stay on permanently, so powering off only has to turn off the TV. For some reason, it’s a full four to five seconds before the TV powers off, and the IR sensor registers activity for a further four to five seconds after it has turned off. This isn’t a fault of the Harmony per se, but is a factor to consider when dealing with some multiple, same brand devices like the Apple TV’s (or an Apple TV and Mac). The Apple remote works in one of two ways. We’ll call the first mode “Universal”. This is how Apple devices ship: any Apple Remote will control any Apple device. This would be fine if there were two Apple TV’s in separate rooms. At home, we have two Apple TV’s and I want to consolidate the AV gear in the basement. Right now, the first floor AV gear is in the basement and the second floor AV gear is in a closet on second floor. But this means I have two Blu-ray players and two Apple TV’s. I want to add a second Windows Media Center, but rather than spend $700-800 and have to continually buy two of everything, I figured I’d consolidate everything in a central location and install an HDMI matrix switch. So now I have two Apple TV’s in the basement. When they are in universal mode, the command from the Logitech on one floor will affect both Apple TV’s. Clearly, this is no good. The other option is to pair a remote with the Apple TV. The problem is you can only pair one remote with the device. So I would have to choose which one is paired with the first floor remote and which is paired with the second floor remote. To complicate things further, my wife and I have separate accounts and will frequently want to watch things on different Apple TV’s in different locations. The only way to solve this problem is to be able to leave the Apple TV’s in “Universal” mode and direct IR commands to a specific device and only that device. The Harmony does have very limited macros. They’re called sequences, but are limited to five steps. Consequently they have limited use and again are activity specific, so my “Sleep 60” sequence, which can be used in three activities, needs to be created and selected three times. Many mid to high end AV components have RS232 ports. These provide much more reliable and much faster control that IR. They also often provide much more granularity. Clearly, this is not possible without some kind of central controller. Finally, the lack of any sensor input. This is critical if you have devices that only have power toggles (no discrete power on/off commands) or have to install a reliable solution where people turn devices on and off by other means (sleep timers, other remotes, front panel controls, power outages, etc.). They can also improve programming and system. For example, with a video or voltage sensor connected to an Xbox, when one of the kids powers it on, it could switch on the TV and select the correct input. No need to teach the kids how to use the remote (or give it them to destroy). With devices like the URC MSC-400, voltage or video signal sensors can be used to detect when a device is on (or confirm that it’s on) and take the appropriate action (power on other devices, skip warm-up delays, etc.). For me, having everything out of sight and a few devices without discrete power on/off commands, sensor input is a key factor (for bullet-proof automation). As one would expect, URC products cost quite a bit more than Logitech’s, but they offer a LOT more functionality. In addition, a full URC system is considerably cheaper than the likes of Creston, etc., but can offer a great deal of the functionality for a fraction of the price. Currently, URC has two residential product lines: Complete Control and Total Control. Total Control is the new product range that supports apps and has much more bi-directional functionality. The good news for those on a budget is that the previous generation is readily available online and is pretty inexpensive. I picked up a brand new MSC-400 for $110 (plus a lightly used spare for $40) and two MX-780’s for $100 each. Normally these would retail for $599 and $299 respectively. Before you rush out and buy these, be aware of two things. They are not compatible with the new Total Control range (not a problem for me) and they are normally dealer-installed products. Apparently, it is at the discretion of the dealer whether to provide the programming software or not. Even if the software is supplied by the dealer, without access to the URC dealer website, programming them will be a challenge. The URC dealer portal has plenty of tech notes, videos and a user forum. My advice would definitely be to buy from an authorized dealer and have the system professionally installed. Also, think very carefully about buying the Complete Control vs. Total Control range. The price difference of the hardware is only a few hundred dollars. We’ll discuss Total Control in more depth later in the article. As I have a lot of home automation and AV installation experience and I test a lot of products, I decided to take the challenge head-on. I loved the feel of the MX-780. At 8oz, it has a heft without feeling heavy and exudes quality in comparison to the Logitech products, which I find cheap looking and feeling (especially the One). 6 x IR emitter or RS232 ports. As it’s recommended to use an authorized dealer, we’ll just touch on the salient points here. Most of the remotes have their own editors, or they can be configured from within Complete Control Program (CCP). CCP is similar to most windows apps with a ribbon at the top (that can be collapsed) and multiple panels that can float or can be docked anywhere on the workspace. The software is fairly intuitive, but a few things are a little hard to find. A quick scan of the help guides always solves the problem. In my case, I setup three floors and assigned the devices to these locations. When the MSC-400 is added, the ports can be named, which makes it a lot easier to remember what is connected to what during programming. The next step is to add and configure devices to the remotes. This is a five step process and is pretty straightforward. For the MSC-400 base station, the steps are a little different, and offer much more control. Serial database. This is identical to select IR code sets, but for RS232. Smart Macros. This is where a lot of the power exists. Now we’ll kill two birds with one stone: we’ll explore the features in more detail and see how the URC solution handles the limitations of the Logitech Harmonies. Technically, with the URC system I installed, the device state isn’t in the remote per se: it’s in the MSC-400, so anything that runs on the MSC-400 (pretty much everything except remote TV’s) knows about device state, whether that be via variables or sensors. Assuming sensor inputs are not used, the state of devices, current user, current floor, etc. can all be tracked with variables. If we take a simple example of a Blu-ray player that does not have discrete power on/off codes, we simply create a variable called “BlurayOn”. All variables default to false, so in the case of power failure or system reset, the assumption is that everything is off. When my “Watch Blu-ray” activity runs, the first thing it does is run a nested macro called “PowerOnBluray”. This checks the state of the “BlurayOn” variable. If it’s TRUE, it skips the power on and any warm-up delay. If it’s FALSE, it sends a Power Toggle command to the Blu-ray, waits for any warm-up delay, sets the “BlurayOn” variable to TRUE and then continues. Variables are a big help with devices that only have power toggle commands, but even if discrete on/off codes are available, the ability to check the state of a device (via a variable or sensor state) is useful. The discrete codes will facilitate bullet proof automation, as there’s no chance of actually toggling the power the wrong way; however, they can also be used for optimization. If a TV needs a ten second warm up period, that delay can be skipped if the “system” can guarantee that the TV is already on. This results in not only bullet proof, but also speedy control. Location selection. Select bedroom and only the activities relevant to the bedroom are shown. User selection. I want much more control over my AV gear than my wife does. She’s happy with transport controls for each activity, so I can simplify the user interface for her, without crippling the system for me. Nearly everything in CCP can be copied and pasted, so setting up multiple similar remotes is a breeze. Where the system really shines though, is with the use of a central controller like the MSC-400. With the MSC-400, I program all my macros there and select which emitter or RS232 to send commands to and then simply link these to each remote (or link to one and copy it). The beauty of this is that if I decided to change my “Watch Movie” macro (maybe I just added powered shades), all I do is edit the macro on the MSC-400 and voila, all remotes now automatically open and close the shades. This applies even if I have several different models of remote: I may have a touch screen in the theater, a higher end, wand style remote in the living room and a basic remote in the kitchen. All of them that use that activity now get the new functionality. With the model I purchased this is not possible directly. There are a few workarounds possible with external timers, etc. That said, I can still get bullet proof control when using the sleep timer on the TV. If I use a voltage, or video sensor, I have the ability to know the true state of the device and execute the relevant steps of the macro accordingly. So when my select “Watch TV” in the morning, the macro checks the Plamsa’s voltage sensor and determines if it needs to turn on the TV. Some of the higher end Complete Control remotes are equipped with sleep timers and, as we’ll see later, the new Total Control base station have very comprehensive timer functions. This is a breeze with URC by using jump commands. In the case I mentioned in limitations above, when the user runs an activity that requires the analog input on the soundbar, the user can be prompted with a message such as, “Is the LED orange?” or “What color is the LED?” clicking “No” or “Green”, will cause the macro to toggle inputs. If “Yes” or “Orange” are clicked, no change will be made. Another common use of custom prompts is in Power off macros. When the user presses the power off the button, they can be prompted whether they want to turn off the current device or the entire system. With the internet, it’s normally a five minute task to find virtually any hex code for any device. Often, the hex codes that are sought are those for discrete commands or advanced functions that help make automation both bullet-proof and perfectly tailored to a user’s needs. These hex codes are easily entered using the Hex editor in the Universal browser in CCP. With the URC remotes, I can pick up the remote when the AV system is off, press virtually any button and have it do something. There’s no need to start an activity or select a device. So if I have 6 common lighting schemes, I can have these available on the main page (or on hard buttons) when the AV system is off. As mentioned earlier, with Harmony remotes, this the main reason for the use of the help button. The user runs an activity, such as “Watch Movie” and then has the keep the remote pointing at the TV while it sends a TV power on, TV warm-up delay (10 secs), AVR power on, AVR warm up delay (5 secs) and finally a Blu-ray power on and warm-up delay (3 secs). This means there is long time when interference can affect the macro and the user has to ensure that the emitter is not obstructed for the entire period. When using a base station like the MSC-400, things improve dramatically. First, the remote sends a very short RF command to trigger the macro. The remote can now be put on the coffee table while the rest of the macro executes. This also ensures the shortest possible window for interference to occur or the user to do something wrong. Further, although the commands on the MSC-400 are sequential, the entire process can be optimized. With the Harmony, in the above example, I will get 18 seconds of delays, so the entire process will take at least 18 seconds. With the MSC-400, I can power on the TV, AVR and Blu-ray and delay for ten seconds: the longest of the three. If I can guarantee the TV is already on (with a sensor or a variable), I can reduce this to five seconds. Again, this is a breeze with the MSC-400. I simply leave the Apple devices in universal mode, connect emitter 1 to Apple TV1 and connect emitter 2 to Apple TV2. When I’m watching Apple TV1 the commands are sent only to Apple TV1; when I’m watching Apple TV2 the commands are sent only to Apple TV2. URC macros can have up to 255 steps. Coupled with conditional logic and ability to nest macros, this is head and shoulders above the Harmony solution. This is pretty cut and dried: URC has it, Harmony does not. 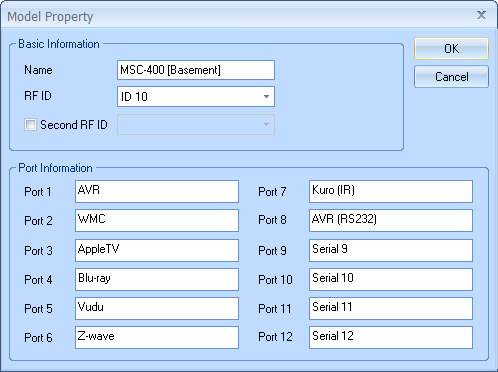 What’s really nice on the MSC-400 is that six of the ports can be configured for either IR or RS232. This allows a maximum of 12 IR devices, six IR and six RS232, or any combination in between. 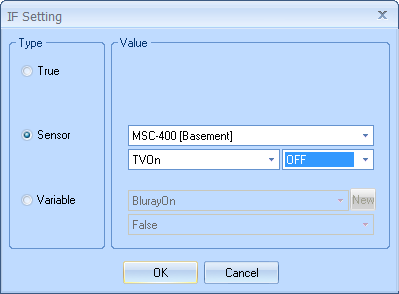 If it’s off, run the TVPowerOn macro; if not, continue and skip the TV warm-up delay. With this approach, I don’t have to care how the TV got turned off (sleep timer, power failure, front panel control, etc.). I can always guarantee its status, so I know when I need to power it on or off. The other thing that can be done with sensors is to use them to trigger macros. So, I could connect a voltage sensor to the Blu-ray or a video signal sensor to the game console, as soon as the sensor detects the device is on, it could power on the TV and the AVR, and set the relevant inputs. Voltage sensors can be used with light detection sensors, current sensors, relays, etc. As long as the sensor can detect an AC or DC voltage in the range of 5-25 volts, it can trigger a macro. There are two additional MSC-400 functions worth mentioning: PC keyboard emulation and relays. The USB keyboard can be used to emulate a keyboard, so can be used to send commands to other computers. In my configuration, I will use this to trigger events on my home automation system. The uses are only limited by installers imagination. From what I’ve read, URC planned to support bi-directional RS232 communication, but with the rapid adoption of IP control, this was dropped. The, new, Total Control range offers full bi-directional control via IP, which also means iOS and Android apps are supported. In the event where an MSC-400 is controlling more than one system (e.g. 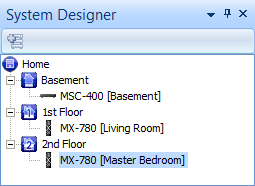 home theater and bedroom), commands could be lost if a user sends a command while a macro is executing, as the same processing engine is shared between all ports. Several installers have reported two or three systems being controlled from a single MSC and several remotes without incident, so it really is an edge case, but van happen. In the MRX-10 (Total Control base station), there are separate macro engines for each IR output and the device can buffer macros. Being designed for custom installers, one would think the MSC-400 would have a rack mount kit. Unfortunately not. In addition, it’s about 1.5U high (which messes up rack spacing) and the unit needs to be removed from the rack to reach the emitter strength adjustment and to access the reset button. Fortunately, such adjustments are rare and all of these issues are addressed in the Total Control base stations. The key feature of Total Control is fully bi-directional IP communication allowing much wider integration and support for Apps. Newer hardware and processing engines allow the system to be expanded via IP and simultaneous processing of macros. The MRX-10 has four serial ports and eight IR ports versus the MSC-400’s six and 12 (max) respectively. With IP control becoming more common, the reduction in RS232 ports should not be a concern. URC definitely brings home automation within most people’s budget. The Complete Control solutions are available at very attractive prices and offer significant improvements over Logitech Harmonies (or other IR controlled solutions). With the exception of the sleep timer (which can be solved with a current sensor on the TV), it overcame all the limitations of my Logitech based solution. If you can get hold of the CCP software and are prepared to do the research, you could program it yourself: if that’s your thing. If buying from a dealer, which I’d highly recommend, I see no reason to buy the Complete Control instead of Total Control. The hardware price difference is minimal and Total Control offers much more flexibility and future expansion. Hopefully, I’ll have the opportunity to review Total Control in the near future.